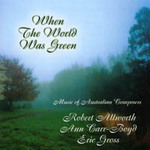 When the world was green : music of Australian composers. 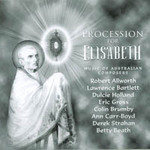 When the world was green : three pieces for piano (and optional violin) / Ann Carr-Boyd. "When the World was Green" a play by Sam Shepard, was premiered in Australia at the Belvoir Downstairs, a Sydney theatre, in 1998.
these appeared both as background and feature music. Contents note: When the world was green -- Slow jazz -- Carl's motel music.